FOR A COMPLETE LIST OF WINNERS, PLEASE GO TO THE WINNERS LIST TAB. ©2018 Elmer's Philippines.All Rights Reserved. OPEN ONLY TO LEGAL RESIDENTS OF THE PHILIPPINES WHO ARE AT LEAST SIX (6) YEARS OLD TO TWELVE (12) YEARS OLD AT THE TIME OF ENTRY. THE ENTRANT MUST HAVE HIS/HER PARENT/LEGAL GUARDIAN ENTER ON HIS/HER BEHALF. MANY WILL ENTER, FEW WILL WIN. 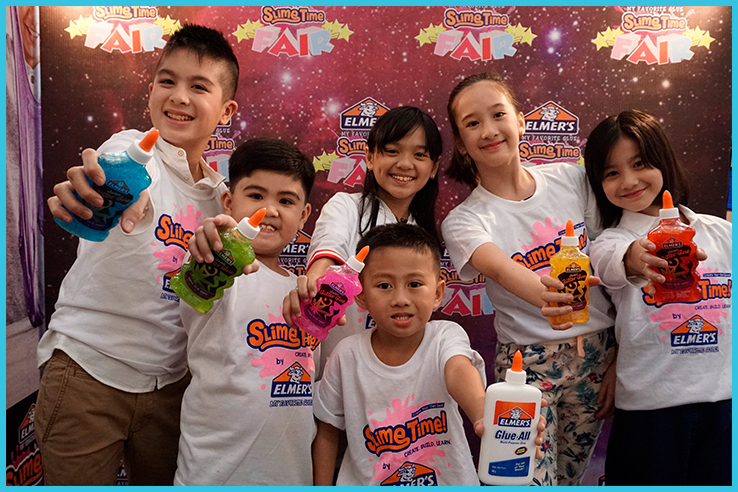 The ELMER’S SLIME SQUAD (“Contest”) is sponsored by Times Trading Co., Inc. (“Sponsor”), 523-525 Quintin Paredes St., Binondo, Manila. At the conclusion of the Contest Period, the First Prize Winners for each age category (total of four  first prize winners) will be judged to determine the Grand Prize Winner. Administrator’s computer is the official clock of the Contest (following Philippine Standard Time). 2.0 ELIGIBILITY: This Contest is open only to legal residents of the Philippines who are at least six (6) years old at the time of Entry. Entrants who are between six (6) and twelve (12) years of age must have their parent/legal guardian’s consent to enter and participate to this contest and follow all rules stated herein. Employees of Sponsor, Administrator, and each of their respective owners, parent companies, subsidiaries, affiliates, 2 representatives, advertising and promotion agencies, agents (collectively, “Contest Entities”) and each of their immediate family members (e.g., spouse, parent, child, sibling, and their respective spouses and the “steps” of each, regardless of where they reside) are not eligible to enter or win. Participation constitutes entrant’s full and unconditional agreement to these Official Rules and Sponsor’s decisions and interpretations, which are final and binding in all matters related to the Contest. Winning a prize is contingent upon fulfilling all requirements set forth herein. Entrants and/or potential winners may be required to provide proof of identification and eligibility as required by Sponsor or Administrator. For purposes of the Contest, an entrant’s residential address must be their current physical address at the time of Entry. Entrants will not be allowed to change any of the details they have provided after their registration. The entrant must visit www.elmerslimesquad.com to upload his/her Entry. Prior to uploading, the Entrant will be asked about his/her birthdate to confirm the age category he/she is eligible with. If the entrant does not meet the age qualifications, he/she will receive a notification on the website that his/her age is not eligible to join the contest. Once the Entrant successfully created his/her account, an email confirmation will be sent to the email address of the parent/legal guardian. The parent/legal guardian must confirm their registration by clicking the link provided in the email in order to activate the account. Only confirmed accounts can start uploading videos. The Entrant needs to locate the file on his local computer. -I have read and hereby agree to the Official Rules of the contest. -I hereby grant my Parental Consent for my child to join this contest. The parent/legal guardian must read the Official Rules prior to clicking the “Submit” button. Both “Agree to the Official Rules” and “Grant my Parental Consent” boxes should be checked by the parent/guardian in order to proceed with the uploading. If the parent/legal guardian does not agree to the Official Rules of the contest, does not provide his/her parental consent or both, the uploading of video will not pursue even if the “Submit” button is clicked. If the parent/legal guardian agrees to the conditions and clicks the “Submit” button, the uploading of the video will commence. Once completed, the Entrant will be redirected to a page confirming the successful uploading of his/her entry. An email will be sent to the parent/legal guardian’s email to confirm the uploading of the entry. 3.2 CONFIRMATION EMAIL: Once the consent has been given by the parent/legal guardian and the video uploading has been successful, the Entrant and the parent/legal guardian will receive an email containing their child’s entry link in the website. Receiving an email with the entry link means the entry is now available for viewing and can now garner video votes in the website. 3.3 ENTRY LIMIT: An Entrant can enter multiple slime making videos per day. However, an Entry must be unique and may only be submitted once for the entire contest. If the same Entry is entered more than once, all subsequent Entries submitted during the Contest Period using that same Entry will be void, and the entrant may, in Sponsor’s sole discretion, be disqualified. For clarity, an entrant may submit multiple Entries during the Contest Period, but each Entry must be a unique glue slime ingredient list and Video. If the entrant submitted a video that was previously submitted for a different slime category, the Entries may, at the Sponsor’s sole discretion, be disqualified. 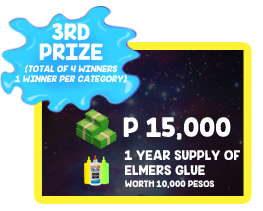 3.4 ENTRY DISTRIBUTION: Entries will be placed into a publicly viewable on Elmer’s Slime Squad website and may be reposted on Elmer’s PH Facebook account. Submitting an Entry constitutes entrant’s (and if a minor, his/her parent/legal guardian’s) grant to Sponsor and its respective parents and affiliates, and the employees, officers, directors, licensees, designees, agents, 3 successors and assigns (collectively, “Grantees”), of a royalty-free, irrevocable, perpetual, nonexclusive license to use, reproduce, modify, post, distribute, publish or create derivative works from and display the Entry in whole or in part, on a worldwide basis, and to incorporate it into other works, in any form, media or technology now known or later developed, including for promotional, advertising, public relations, trade show and/or marketing purposes, without further compensation, notification or permissions of any kind except where prohibited by law. If requested, entrant (and if a minor, his/her parent/legal guardian) will sign any documentation that may be required for Sponsor or its respective designees to make use of the nonexclusive rights entrant is granting to use the Entry. This license expressly includes a right (but not the obligation) for Sponsor to modify Entries to remove any third party intellectual property. Sponsor shall have the right, in its sole discretion, to edit, composite, morph, scan, duplicate, or alter the Entry for any purpose which Sponsor deems necessary or desirable, and each Entrant irrevocably waives any and all so-called moral rights they may have therein. Each entrant hereby acknowledges that such entrant does not reserve any rights in or to the Entry. The displaying of an Entry on any website/Facebook platform does not constitute verification of eligibility or compliance with these Official Rules and all Entries and entrants remain subject to verification of eligibility and compliance with these Official Rules as determined by Sponsor at its sole discretion. 3.5 NON-EXCLUSIVITY RIGHTS: UNLESS THE ENTRANT IS A WINNER, EACH ENTRANT REPRESENTS, UNDERSTANDS AND ACKNOWLEDGES THAT HE/SHE WILL NOT BE PAID FOR OR RECEIVE ANY FORM OF COMPENSATION OR ROYALTY (OTHER THAN THE PRIZE STATED HEREIN IF SELECTED AS A WINNER) IN EXCHANGE FOR GRANTING SPONSOR THE NON-EXCLUSIVE LICENSE RIGHTS OR FOR ANY SUBSEQUENT USE OF SUCH ENTRY BY SPONSOR. If requested, entrant will sign any documentation that may be required for Sponsor or its designees to make use of the non-exclusive rights entrant is granting to use the Entry. 3.6 DISPLAY OF ENTRIES ON SOCIAL MEDIA: Entrants agree that Sponsor has the right, but not the obligation, to use and/or otherwise display the Entries as set forth above, and that if such Entries are, in Sponsor’s sole discretion, displayed on any website/Facebook platform, such Entries may be subject to third party comments that will be publicly viewable, and further, such Entries may also be saved, shared, and/or further e-mailed by such third parties on the internet or otherwise. By submitting an Entry, an entrant hereby agrees to these Official Rules. All Entries are subject to confirmation and/or verification and compliance with these Official Rules as determined by Sponsor and/or Administrator. Sponsor reserves the right, in its sole and absolute discretion, to disqualify any Entries that do not comply with the above terms, the Entry Guidelines and Requirements as set forth in below, or any other provision of these Official Rules. 3.8 MOBILE CHARGES: Note: If an entrant accesses the Website on his/her mobile device to enter this Contest, the entrant’s wireless service provider may charge the entrant for applicable data charges.Entrants should consult their wireless service provider regarding its pricing plans. Message and data rates may apply. Entrants should review their mobile device’s capabilities for specific mobile application instructions. 3.9 COMPLIANCE OF ENTRY GUIDELINES: By submitting an Entry, each entrant agrees that his/her Entry conforms to the Entry Guidelines and Restrictions set forth above and that Sponsor and/or Administrator may, at their sole and absolute discretion, disqualify him/her from the Contest if Sponsor/Administrator decides that his/her Entry fails to conform to the such requirements or any other provision of these Official Rules. 4.0 PUBLIC VOTATION: Only the entries with email confirmation sent to the parent/guardian’s email address will be uploaded in the website and viewable in the Elmer’s Slime Squad Video Gallery. Once the Entry has been uploaded, all votes generated from the date of its upload until the end of the voting period will be counted. Votes generated by script, macro or other automated means are void. Votes must be completed by the actual person using the website. Votes intended to improperly impact the integrity of the voting process, as determined by Sponsor in its sole discretion, are void. Payment or other consideration in exchange for views is prohibited. Voters will not have any opportunity to win any prizes in this Contest. 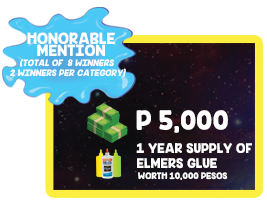 5.0 VOTING PERIOD:Once the entry is made available in the Elmer’s Slime Squad Video Gallery, the entry can now accumulate votes. The Entrants will be given a link of their entry through email. The Entrant may share the link to his/her friends to gain video likes which is the main criteria for the semi-finals. A voter may like an entry by visiting the link of the entry and clicking the “Vote” button. The system will ask the voter to provide his email address. Once the email address has been provided by the voter, an automated email will be sent to the said email address to confirm authenticity of the “Vote”. The voter must confirm his “Vote” in order to be counted. Only confirmed “Votes” within the voting period will be counted. Voting period starts on October 1, 2018, and ends in November 30, 2018 at 11:59pm. A voter can only “Vote” an Entry once; an email address can only be used to “Vote” an Entry once. To clarify, an email address can be used to “Vote” multiple Entries, but can only cast a “Vote” once per Entry. 6.0 SEMI-FINALIST SELECTION: The ten (10) entries with the most number of “Votes” from each slime and age category by the end of the “Voting period” will be the semi-finalist of the contest. This means all “Votes” generated by the entry from the time it is made available for voting until the end of the voting period will be counted. All entries will still be available for voting in the website and may still capture video votes by the end of the voting period. To determine the ranking of winners, the scores of the qualified judges for the (1) Creativity and Originality and (2) Clarity of Expression and Execution will be combined. Judging will be held on December 12, 2018, at Times Trading Co., Inc. office, under the supervision of a DTI representative. Each Category will have its own sets of winners. The entrant whose Entry receives the highest score from the Judges in a Category will be deemed the potential First Prize Winner (Category Winner). The entrant whose Entry receives the second-highest score from the Judges in a Category will be deemed the potential Second Prize Winner. The entrant whose Entry receives the third-highest score from the Judges in a Category will be deemed the potential Third Prize Winner. The entrants whose Entry falls on the fourth and fifth-highest score from the Judges in a Category will be deemed the potential Honorable Mentions. In the event of a tie, the tied Entries will be reviewed by the Judges and the Entry with the highest score in “Creativity and Originality” theme will be named the potential winner for that Category prize level. Each potential winner will be notified on or about three (3) to five (5) business day after the conclusion of the specific Judging Period. The entrant with the highest number of votes by the end of the “Voting Period” regardless of the category he/she has participated in will be awarded with the “Special Award - People’s Choice Award”. 8.1 GRAND PRIZE SELECTION: Once all four (4) First Prize Winners have been confirmed, the First Prize winner with the highest weighted score based on the same Judging Criteria will be determined as the potential “Grand Prize Winner”. The potential Grand Prize Winner will be announced on December 14, 2018. The entrant can only win once for the entire contest regardless of the category he/she is joining in. All winners are subject to verification of eligibility and compliance with these Official Rules. Decisions of the Judges, Sponsor, and Administrator are final and binding. -Tickets to Manila Ocean for the one (1) Grand Winner and one (1) parent/legal guardian Park (worth Php 1,990). Opportunity to star in a solo Elmer’s Slime Making Video in a full studio set up (video to be shown on Facebook). Opportunity to star in a solo Elmer’s Slime Making Video in a full studio set up has no value, and Grand Prize Winner will not receive any compensation for his/her involvement, aside from the Grand Prize as set forth above. 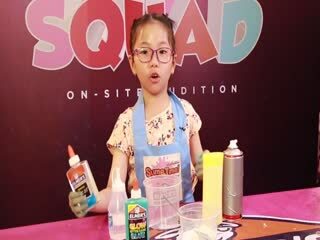 Opportunity to star in a Slime Squad Slime Making Video together with the Grand Prize winner and other First Prize winners (Full studio set up, video to be shown on Facebook). Opportunity to star in a Slime Squad Slime Making Video in a full studio set up has no value, and Grand Prize Winner will not receive any compensation for his/her involvement, aside from the Grand Prize as set forth above. 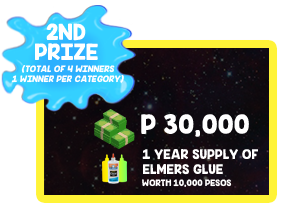 All non-winner semi-finalists (total of 19) will receive Php 2,000 worth of Elmer’s Glue supplies as consolation prize. The Grand Winner and three (3) First Prize winners will be the “members” of the “Elmer’s Slime Squad”. Each member of the Slime Squad, together with their one (1) parent/legal guardian will be enjoying an educational tour paid by the Sponsor. Schedule will be set by the sponsor and shuttle service will be provided to be shared by the Elmer’s Slime Squad and their parents/legal guardians. Members of the Slime Squad currently residing within Greater Manila Area will be given a pick up location for Shuttle Service during the educational tour. Expenses going to the pickup location shall be shouldered by the members. If one of the Members of Elmer’s Slime Squad is residing outside the Greater Manila Area, the sponsor will provide a round trip ticket to Manila (plane or bus, whichever is available, worth Php 16,000) and three (3) days and two (2) nights hotel accommodation for the member together with his/her one (1) parent / legal guardian (worth Php 12,000). All Cash Prizes are Tax Free. 11.0 GENERAL CONDITIONS: In no event will more prizes than stated in these Official Rues be awarded. All taxes and other expenses, costs, or fees associated with the acceptance and/or use of the prize are responsibility of the sponsor. 12.0 HOW TO CLAIM A PRIZE: After each Voting Period, Administrator will notify the potential winners via phone call, registered mail and e-mail at the e-mail address provided at the time of registration. Prizes can be claimed at Times Trading Co., Inc. office located at 523-525 Quintin Paredes St., Binondo, Manila until 60 days from the receipt of the registered mail. Failure to provide the requirements above will result to disqualification of the potential winner. If any potential winner is disqualified, found to be ineligible or not in compliance with these Official Rules, declines to accept a prize, or in the event that the potential Grand Prize Winner or First Prize Winner fails to provide the complete the requirements, the prize may be forfeited upon approval of DTI. If a prize is forfeited, the prize may be awarded to an alternate winner, determined as the Entry that received next-highest score from the Judges from among all remaining eligible Entries for the applicable Entry Period, as determined by Sponsor in its sole discretion. If, after a good-faith attempt, Sponsor is unable to award or deliver a prize, the prize may not be re-awarded. Each prize will only be awarded to a verified winner. List of winners will be announced through a newspaper publication and through digital advertisement. Special Award – People’s Choice Award will be announced on December 2, 2018, under the supervision of a DTI representative. Sponsor will attempt to notify the potential winners as set forth above, but Sponsor is not responsible for any undelivered e-mails, including without limitation e-mails that are not received because of a winner’s privacy or spam filter settings which may divert any Contest e-mail, including any winner notification e-mail, to a spam or junk folder. Prizes are non-transferable and no prize substitution, exchange or cash equivalent will be allowed, except by Sponsor, who reserves the right to substitute a prize of equal or greater value in case of unavailability of the prize or force majeure, at Sponsor’s sole and absolute discretion. In addition, if the winner fails to claim the prize within 60 days after the receipt of the registered mail, prizes will be forfeited and cannot be re-awarded. 13.0 LIMITATION OF LIABILITY: By participating in this Contest, entrants agree that the Contest Entities and each of their respective affiliates, subsidiaries, representatives, consultants, contractors, legal counsel, advertising, public relations, promotional, fulfillment and marketing agencies, website providers and each their respective officers, directors, stockholders, employees, representatives, designees and agents (“Released Parties”) are not responsible for: (i) lost, late, incomplete, stolen, misdirected, postage due or undeliverable e-mail/text notifications or postal mail; (ii) any computer, telephone, satellite, cable, network, electronic or Internet hardware or software malfunctions, failures, connections, or availability; (iii) garbled, corrupt or jumbled transmissions, service provider/network accessibility, availability or traffic congestion; (iv) any technical, mechanical, printing or typographical or other error; (v) the incorrect or inaccurate capture of registration information or the failure to capture, or loss of, any such information; (vi) any error, omission, interruption, deletion, defect, delay in operation or transmission, communications line failure, technical error, theft or destruction or unauthorized access to the Contest; (vii) any injury or damage, whether personal or property, to entrants or to any person's computer related to or resulting from participating in the Contest and/or accepting a prize; and (viii) Entries that are late, forged, lost, misplaced, misdirected, tampered with, incomplete, deleted, damaged, garbled or otherwise not in compliance with the Official Rules. Further, the Contest Entities are not responsible for any unanswered or undeliverable winner notifications. 13.1 ENTRANT ACCOUNTABILITY: By entering the Contest, each entrant agrees: (i) to be bound by these Official Rules, including Entry requirements; (ii) to waive any rights to claim ambiguity with respect to these Official Rules; (iii) to waive all of his/her rights to bring any claim, action or proceeding against any of the Released Parties in connection with the Contest; and (iv) to forever and irrevocably agree to release and hold harmless each of the Released Parties from any and all claims, lawsuits, judgments, causes of action, proceedings, demands, fines, penalties, liability, costs and expenses (including, without limitation, reasonable attorneys’ fees) that may arise in connection with: (a) the Contest, including, but not limited to, any Contest-related activity or element thereof, and the entrant’s Entries, participation or inability to participate in the Contest; (b) the violation of any third-party privacy, personal, publicity or proprietary rights; (c) acceptance, attendance at, receipt, travel related to, participation in, delivery of, possession, defects in, use, non-use, misuse, inability to use, loss, damage, destruction, negligence or willful misconduct in connection with the use of a prize (or any component thereof); (d) any change in the prizes (or any components thereof); (e) human error; (f) any wrongful, negligent, or unauthorized act or omission on the part of any of the Released Parties; (g) lost, late, stolen, misdirected, damaged or destroyed prizes (or any element thereof); or (h) the negligence or willful misconduct by entrant. 13.2 ENTRANT ACCOUNTABILITY: If, for any reason, the Contest is not capable of running as planned, Sponsor reserves the right, at its sole and absolute discretion, to cancel, terminate, modify or suspend the Contest and/or proceed with the Contest, including the selection of winners in a manner it deems fair and reasonable, including the selection of winners from among eligible Entries received prior to such cancellation, termination, modification or suspension. In no event will more prizes be awarded than are stated in these Official Rules. In the event that, due to technical, typographical, mechanical, administrative, printing, production, computer or other errors, there are more winners than are stated in these Official Rules, a random drawing among the claimants will be held to determine the winner. WITHOUT LIMITING THE FOREGOING, EVERYTHING REGARDING THIS CONTEST, INCLUDING THE PRIZES, IS PROVIDED “AS IS” WITHOUT WARRANTY OF ANY KIND, EITHER EXPRESS OR IMPLIED, INCLUDING BUT NOT LIMITED TO, THE IMPLIED WARRANTIES OF MERCHANTABILITY, FITNESS FOR A PARTICULAR PURPOSE OR NON-INFRINGEMENT. 15.0 PUBLICITY RIGHTS: By participating in this Contest, each entrant (or, if a minor, his/her parent/legal guardian) agrees to allow the Sponsor and Sponsor’s designee the perpetual right to use his/her name, address (city and state), biographical information, likeness, picture and other information and content provided in connection with the Contest for promotion, trade, commercial, advertising and publicity purposes in all media worldwide including, but not limited to, on television and the Internet, without notice, review or approval and without additional compensation, except where prohibited by law. 16.0 GENERAL: Any attempted form of participation in this Contest other than as described herein is void. Sponsor and Administrator reserve the right to disqualify any entrant found or suspected, in their sole and absolute discretion, to be tampering with the operation of the Contest; to be acting in violation of these Official Rules; or to be acting in an unsportsmanlike manner or with the intent to disrupt the normal operation of this Contest. Any attempted form of participation in this Contest other than as in 9 these Official Rules is void. If it is discovered that a person has registered or attempted to register more than once using multiple phone numbers, e-mail addresses, residential addresses, multiple identities, IP addresses, use of proxy servers, or like methods, all of that person’s Entries will be declared null and void and that person will not be awarded any prize that he/she might have been entitled to receive. Any use of robotic, automatic, macro, programmed, third party or like methods to participate in the Contest will void any attempted participation effected by such methods and the disqualification of the individual utilizing the same. Entrants and/or potential winners may be required to provide proof of identification and eligibility as required by Sponsor or Administrator In the event of a dispute as to the identity of a winner, the winning Entry will be declared made by the authorized account holder of the e-mail address submitted on the registration form associated with such Entry. "Authorized account holder" is defined as the natural person who is assigned to an e-mail address by an Internet access provider, online service provider or other organization (e.g., business, educational institution) that is responsible for assigning email addresses for the domain associated with the submitted email address. Each entrant may be required to show proof of being an authorized account holder. CAUTION: ANY ATTEMPT TO DELIBERATELY DAMAGE ANY WEBSITE OR UNDERMINE THE LEGITIMATE OPERATION OF THE CONTEST IS A VIOLATION OF CRIMINAL AND CIVIL LAWS. SHOULD SUCH AN ATTEMPT BE MADE, THE SPONSOR RESERVES THE RIGHT TO SEEK DAMAGES OR OTHER REMEDIES FROM ANY SUCH PERSON(S) RESPONSIBLE FOR THE ATTEMPT TO THE FULLEST EXTENT PERMITTED BY LAW. If any provision of these Official Rules or any word, phrase, clause, sentence, or other portion thereof should be held unenforceable or invalid for any reason, then that provision or portion thereof shall be modified or deleted in such manner as to render the remaining provisions of these Official Rules valid and enforceable. The invalidity or unenforceability of any provision of these Official Rules or the prize documents will not affect the validity or enforceability of any other provision. No entrant shall have the right to modify or amend these Official Rules. Sponsor’s failure to enforce any term of these Official Rules shall not constitute a waiver of that provision and such provision shall remain in full force and effect. All Entries and/or materials submitted become the property of Sponsor and will not be returned. In the event of any conflict with any Contest details contained in these Official Rules and Contest details contained in any promotional materials (including but not limited to point of sale, television and print advertising, promotional packaging and other promotional media), the details of the Contest as set forth in these Official Rules shall prevail. Customer Service inquiries may be made at Elmer’s PH Facebook Page. PER DTI Permit No. 18109 Series of 2018. If you browse the Elmer’s Slime Squad website, you may generally do so anonymously without providing any personal information. However, there are cases in which we may ask you for personal data. For example, we will occasionally conduct on-line surveys to better understand the needs and profile of our visitors. In addition, we may request personal information when you register to receive additional information regarding our products and services, download software, sign up for a newsletter or sign up for an online contest. In such cases, the personal information we request will typically consist of: your title, first and last name, mailing address and email address, contact number as well as personal information of your parent or legal guardian (if you are a minor). Additionally, we may provide you with the option of submitting information such as your age, birthday and parental consent, all of which are intended to enhance your experience, and inform you, of our product and service offerings. Even if you choose not to give information we request, you can still visit the Elmer’s Slime Squad website, but you may be unable to access certain options, offers and services. 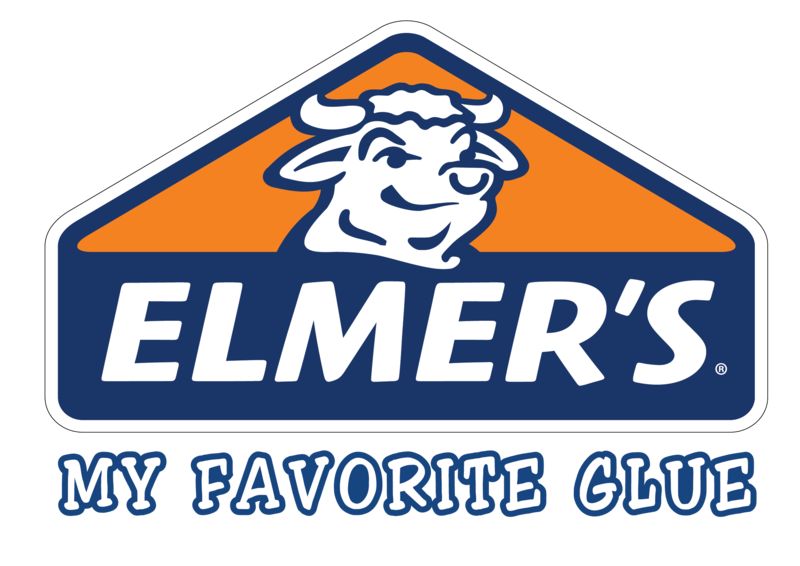 If you provide us with personal information, and choose to join the Elmer’s Slime Squad contest, we will place you on Times Trading Co., Inc. list to receive e-mail regarding product/service updates, special offers, important issues and new products and services of Elmer’s brand. The personal information that you provide to our company will be shared internally. If you do not wish to receive e-mail updates or other marketing communications from our Times Trading Co., Inc. and our brands, please email optout@elmerslimesquad.com to request for non-inclusion of email address in the database. Personal information provided to us may be used for marketing and promotional purposes only by Times Trading Co., Inc.Except as described in this policy, Times Trading Co., Inc., does not rent, sell or otherwise distribute to third parties, your personal information entered on this site without your consent, unless required by law or as disclosed to you when the information is collected. If you do provide us with consent to share your information with other third party companies, we may share your information with third party companies who offer products and services that may be of interest to you. These companies may then contact you directly with product or sample offers, personalized offers and information, or to ask for your feedback on products and programs that they think may be of interest to you. We may share your personal information with our third party service providers on a need-to-know basis. We engage third party service providers to perform certain services on our behalf. In order to perform those services, the service providers may need to know your personal information. We require that they protect this information and only use it to perform services on our behalf. For example, we may use outside shipping companies, credit card processing companies, resellers, distributors and content providers. Additionally, we may share statistical, anonymized or aggregated non-personal information about our users with advertisers, business partners, sponsors and other third parties. This data is used to customize Elmer’s website content and advertising to deliver a better experience to our users. Times Trading reserves the right to disclose user information in special cases, when we have reason to believe that disclosing this information is necessary to identify, contact or bring legal action against someone who may be causing injury to or interference with (either intentionally or unintentionally) our rights or property, other Elmer’s Slime Squad website users or anyone else that could be harmed by such activities. We may disclose personal information without notice to you in response to a subpoena or when we believe in good faith that the law requires it or to respond to an emergency situation. We also may disclose personal information as part of a merger or acquisition. Depending on the country in which you are located, your personal information may be transferred to another country for data storage and processing. When we transfer personal information, we use commercially reasonable efforts to transfer the information in compliance with all applicable data protection laws. This website also may detect and use your IP address or domain name for internal traffic monitoring and capacity purposes or to otherwise administer our website. No personal information is obtained;rather, just the patterns of usage of our various users may be tracked to provide you with improved service and content based on aggregate or statistical reviews of user site traffic patterns. We may use Google Analytics and other analytic tools to gather aggregate, non-identifiable information. Such tools enable us to gather information such as what pages people visit, which products they look at, what device they use and where they are located. Additionally, we currently use CRM tools as part of our CRM program, which allows us to register users on our website and better understand what content they are browsing and which products are of interest to them for ranking and marketing purposes. Currently, (i) other parties (e.g. third-party advertising networks and analytics providers) may not collect personal information about your online activities over time and across different websites when you use our website or services, and (ii) we do not respond to, or take any specific action in connection with the receipt of, Do-Not-Track signals or other similar mechanisms regarding the collection of personally identifiable information about an individual consumer’s online activities over time and across third-party websites or online services. Please be advised that this website may contain links to third party websites. The linked sites are not under the control of Elmer’s Slime Squad, and we are not responsible for the content, or privacy practices or other activities of any linked site or any link on a linked site. Times Trading Co., Inc. reserves the right to change or update this policy, or any other policy or practice, at any time. We will provide individuals who have submitted personal information to us with reasonable notice of material changes to this website. Additionally, you are encouraged from time to time to review any updated versions of this policy, as indicated by the effective date of this policy set forth below. Any changes or updates will be effective immediately upon posting to the site. Your use of this website after such changes or updates have been posted signifies your acceptance of the changed terms. Additionally, if you would like your e-mail address removed from our database, please send an e-mail to optout@elmerslimesquad.com, and type the word "Remove" in the subject line. Please note that questions about our products and services should not be directed to optout@elmerslimesquad.com and will not receive a reply. Your account is not yet registered. Your parent/guardian has not yet verified your account using his/her email.